Riomaggiore is a village in the province of La Spezia, located in a small valley in the Liguria region of Italy. It is the first of the Cinque Terre when traveling north from La Spezia. The village, dates from the early thirteenth century. This painting highlights the character of village with weathering buildings and beautiful harbor. 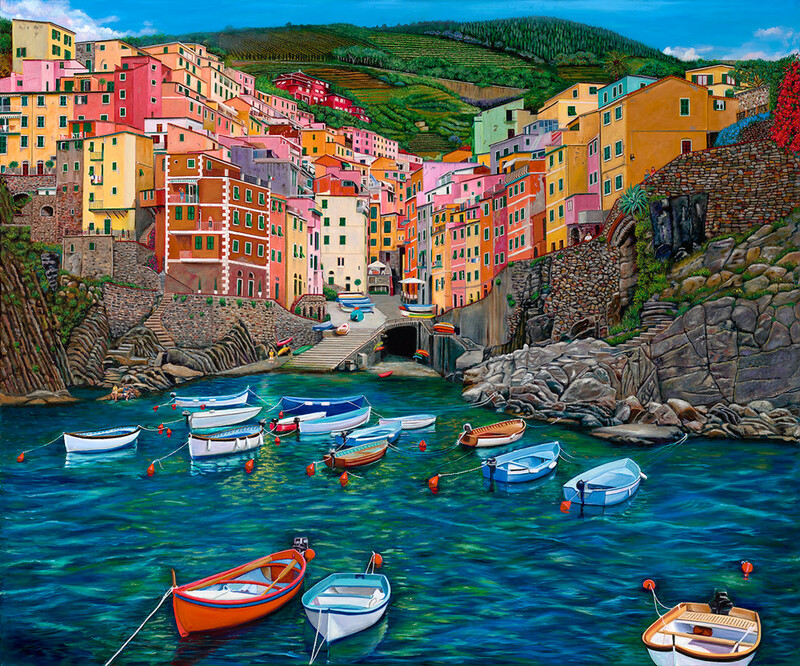 Riomaggiore is a village in the province of La Spezia, located in a small valley in the Liguria region of Italy. It is the first of the Cinque Terre when traveling north from La Spezia. The village, dating from the early thirteenth century, is known for its historic character and its wine, produced by the town's vineyards. Riomaggiore is in the Riviera di Levante region and has a shoreline on the Mediterranean's Gulf of Genoa, with a small beach and a wharf framed by tower houses. Riomaggiore's main street is Via Colombo, where numerous restaurants, bars, and shops can be found. This painting highlights the character of village with weathering buildings and beautiful harbor.